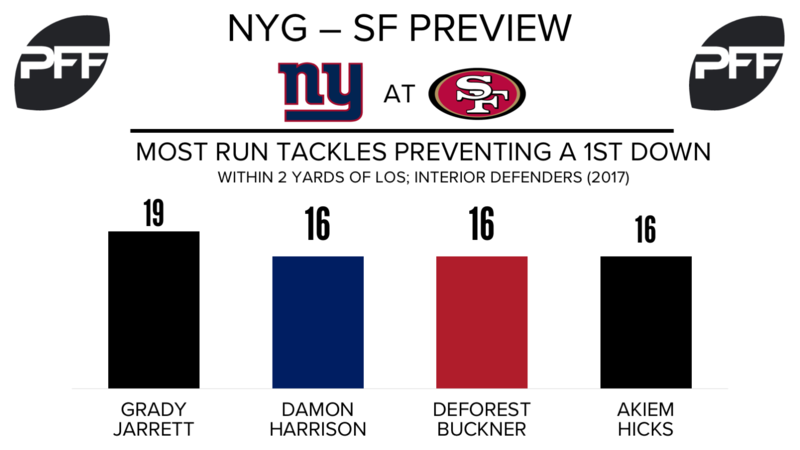 TE Evan Engram vs. LB Reuben Foster – One of the most utilized tight ends in the league may see a fellow rookie in coverage this week. 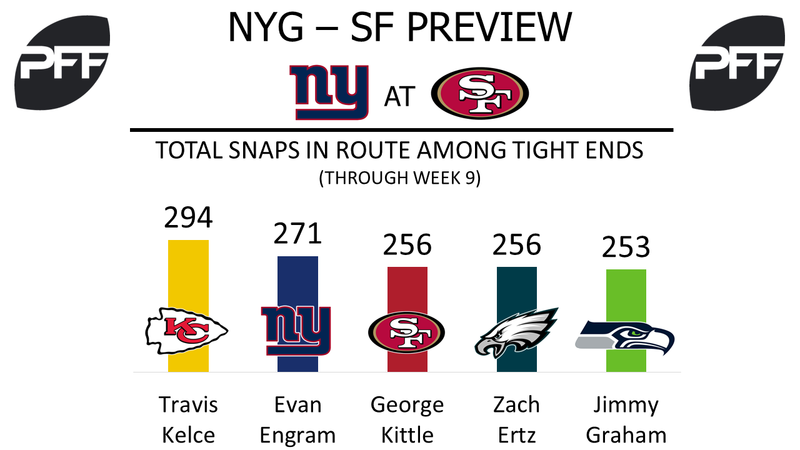 Evan Engram has 271 snaps in route, the second most among all tight ends, only trailing Travis Kelce. He’s seen 57 targets, tied for the third most among all tight ends. Unfortunately, the rookie has struggled with drops, dropping six of his 40 catchable targets, the most among all tight ends. Engram’s drop rate of 15.0 is tied for the highest among all tight ends. Reuben Foster has shown flashes of his potential in limited action, currently boasting an overall grade of 86.2. He’s played 51 total coverage snaps and has been targeted seven times, allowing six receptions for 66 yards. G John Jerry vs. Dl DeForest Buckner – The 30th ranked guard in the NFL, John Jerry draws a tough matchup this week with the second-highest graded interior defender this season, DeForest Buckner. John Jerry had a solid game in pass protection last week, allowing only one pressure on 40 pass-block snaps. He will have to play to the same level, as Buckner currently ranks fourth among 109 qualifying interior defenders with 35 total pressures. Buckner’s pass-rush productivity of 9.7 is currently tied for eleventh among 112 qualifying guards. He’s been excellent against the run as well, with his 22 run stops being the most accrued among interior defenders. Giants’ WRs vs. 49ers’ secondary – After losing both Odell Beckham Jr. and Brandon Marshall to season-ending injuries, there’s a lot left to be desired from the wide receiver play in New York. Sterling Shepard has a receiving grade of 70.4, 60th among 113 qualifying wide receivers,but ahead of both Roger Lewis and Tavarres King who rank 85th and 91st respectively. Luckily for the Giants, the 49ers’ secondary isn’t grading much better. Ahkello Witherspoon has an overall grade of 76.1, 53rd among 115 qualifying cornerbacks, far ahead of Dontae Johnson (100), and K’Waun Williams (112). C Daniel Kilgore vs. DI Damon Harrison — It’s been a rocky season for San Francisco’s veteran center, whose 43.8 overall grade ranks 29th out of 36 qualifying centers, a considerable drop from his 71.6 overall grade a season ago. Kilgore struggled mightily last week against Arizona’s Corey Peters, contributing to 17.1 pass-block grade that was the fourth worst given to a center this season (Kilgore also owns the worst run block grade for a center this year, 24.0, which came in San Francisco’s first game versus the Cardinals). Life won’t get any easier this week, as Kilgore will match up with the NFL’s premier run-stuffing nose tackle. Snacks has made 16 run tackles within two yards of the line of scrimmage preventing a first down this season, tied for the second most among interior defenders behind Grady Jarrett. WR Marquise Goodwin vs. CB Janoris Jenkins — With 49ers dropping like flies in recent weeks, Goodwin has become the team’s de-facto No. 1 wideout. Goodwin makes his money with the deep ball — his 204 yards on targets 20 yards or more downfield are the league’s 10th-most despite only seeing 11 such targets (tied for 22nd). He should spend much of his day facing off against Janoris Jenkins, who returns from a one-week suspension. Jenkins has been targeted six times on deep passes, surrendering three receptions for 93 yards. QB C.J. Beathard when kept clean — Keeping Beathard clean has been the only way for San Francisco to have a functional passing game since he took over as the team’s starting quarterback. When pressured, Beathard is averaging 3.22 yards per attempt (worst) with an adjusted completion rate of 51.1 percent (second worst). The rookie quarterback hasn’t exactly been lights out when kept clean, but those numbers improve to 7.36 (21st) and 72.4 percent (29th), respectively, which is enough for the 49ers to show some signs of life offensively. Beathard should have some hope of staying clean in this game, as the Giants’ pass rush has been underwhelming this season. New York has pressured opposing quarterbacks on 30.9 percent of dropbacks through eight games, the fifth-worst rate in the NFL.